Just as Watchmen criticized the morality of superhero comics, manga like Bokurano and Fullmetal Alchemist criticize the "smiles and happy endings" of shonen manga. "I…hate hurting things…and breaking things…I wish we could all get along…If I can avoid a battle…I think that's best…"
"I'm not going to let anyone be killed!" Postapocalyptic science fiction generally falls into one of two camps: (1) idealistic stories which celebrate the importance of maintaining morality and humanity under terrible circumstances (as in Cormac McCarthy's The Road) and (2) pragmatic stories which delight in pointing out the idiocy of idealists and revealing the awful things we must do to stay alive (as in much of the fiction of John Christopher, J.G. Ballard, David Gerrold). The same divisions can be found in genre manga, from manga which celebrate sentimentality and human compassion to manga which present the readers, and characters, with terrible moral choices. These grim-and-gritty seinen (adult) manga have roughly the same relation to normal shonen (boys') manga as revisionist superhero comics, such as Watchmen, do to normal superhero comics. Watchmen, like most of the famous comics of the '80s and '90s, is not an adult work in an adult medium; it's an adult work consciously grounded in a "children's" medium, and using the conventions of a "children's" genre, the superhero genre. Superhero comics originated out of crime comics, and most superheroes are still crimefighters, whether on a local or cosmic level. The parallel with American foreign policy is clear-as America is "the world's policeman," so some of the most famous superhero comics deal with the idea of the responsibility and morality of having absolute power, from Mark Gruenwald's Squadron Supreme (1985-1986) to Alan Moore and Dave Gibbons' Watchmen (1986-1987) to Warren Ellis and Bryan Hitch's The Authority (1999). The heroes/antiheroes of Watchmen and similar, less self-examining comics fight for lofty ideals, and sometimes hard-headed political concerns, with little concern for the collateral damage. They may get doubts and get angsty about all that responsibility, but well, "heavy is the head that wears the crown" and all that. Children's manga, like superhero comics, has its own genre expectations and conventions of morality. To quote Rurouni Kenshin creator Nobuhiro Watsuki, who always speaks frankly (and approvingly) about censorship in his work, "The basics of a shonen manga are smiles and a happy ending." But compared to superhero comics, manga heroes are usually motivated by more personal concerns, by protecting their family, friends and loved ones. One of the most commonly repeated words in shonen manga, right behind yûjô ("friendship"), is mamoru ("protect" or "defend"). "We're not fighting…we're protecting!" a hero says in One Piece. Phrases like "I'm fighting because I have something I need to protect!" show up over and over in countless manga. For every boys' manga like the '80s hit Fist of the North Star in which defeated enemies have their brains splattered, there are five manga like Dragon Ball Z, in which defeated enemies are befriended, neutralized and converted to the heroes' worldview. Thus, the circle of the protagonists' friends grows and grows. Only in this way, through taking everyone into the protected circle, does the hero get the hubris to want to "save the world" — usually expressed as "I want to protect everyone!" , an almost Buddhist feeling of compassion for all things, except perhaps for some final enemy who is just too ugly to be redeemed. The preference for defensive to aggressive violence in Japanese comics is easily tied back to Japan's postwar political climate. Having experienced the horrors of nuclear bombs and military defeat firsthand, the Japanese public has a strong pacifistic streak, and Article 9 of Japan's 1947 constitution — which forbids Japan from waging offensive war or maintaining a standing army-still has majority support. In addition to the occasional portrayals of swaggering, arrogant Americans (http://www.japanfocus.org/-Matthew-Penney/3116), defeat may have instilled a distrust of ideologues of all kinds. Typically, it's the coldhearted rival or villain characters who speak of abstracts like "the world" or "justice," while the warmhearted heroes care about immediate concerns like their friends. In the climactic scene of Hitoshi Iwaaki's seinen manga Parasyte (1990), in which a hero fuses his body with an alien to protect the earth from alien predators, the hero contemplates letting one of the predators go because it, like him, is just another living being; but then he decides that he has to kill it to protect his friends and other humans like himself. "Forgive me," he says as he delivers the final blow. But regardless of political sentiment, Japanese readers, like people everywhere, are still fascinated with images of power and destruction, and the archetypal form of this power is not a colorful caped hero (or even a colorful gi-wearing martial artist, Dragon Ball Z excepted) but a colorful robot. Like superheroes in the U.S., giant robots are a children's genre that attracts pretty good talent because it pays pretty good money, and is often used by creators to deliver adult messages. Go Nagai's Mazinger Z (1972) and Getter Robo (1974), although strictly kid's shows, upped the level of collateral damage and destruction in the genre, with both heroes and villains smashing cities to pieces, intentionally or accidentally. Yoshiyuki Tomino's famous anime Mobile Suit Gundam (1979) gave the toy-selling formula a backbone of hard sci-fi and military drama, with serious characters making serious choices and sometimes dying. Through Gundam, the giant robot show gained a certain dignity, pleasing both robot fans and military otaku; perhaps science fiction wars on a distant planet were more socially acceptable than imagining wars on this Earth. Then came Hideaki Anno's Neon Genesis Evangelion (1995). Working within the robot genre, Anno broke its rules in two ways: (1) the show was aggressively personal, with Anno openly admitting that the main character's antisocial tendencies and depression were based on his own issues; and (2) the show ripped away all the "romance of the battlefield" veneer of Gundam and its ilk, forcing the main character to commit atrocities in order to save the earth, then in the end, making those sacrifices meaningless. Although Evangelion was very internal and free of political content, in interviews Anno expressed the belief, shared by many Japanese pundits, that Japan's postwar generations had been spoiled and emasculated. 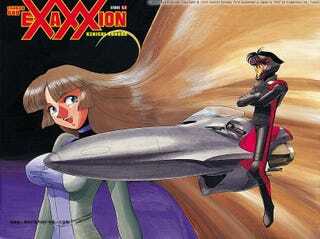 A similar message was expressed much more directly, without Evangelion's neuroses and self-doubt, in Kenichi Sonoda's Cannon God Exaxxion (1998). In this seinen manga update of Mazinger Z, the main character is a manga hero in the old-school sense, fiery and tough, but even he is shocked by the acts he has to commit in order to save the world. The message, expressed with Machiavellian glee by his mad scientist grandfather is that you can't make an omelet without breaking eggs, i.e.you can't save earth from alien invaders in a giant robot without causing tons of collateral damage and smushing tons of innocent people. In Evangelion and Exaxxion, to "protect everyone" is just wishful thinking. Emotion, the warm human feeling valued in shonen manga , has to be thrown out the window when the chips are down. Or to put it another way, in tough times you can't afford to save everyone; you have to protect your own. The message is delivered even more brutally in Mohiro Kitoh's seinen manga Bokurano ("Ours") (2003). In Kitoh's manga , a mysterious otherworldly visitor chooses 12 children to be the pilots of a giant robot and defend the earth against other robots which appear to be piloted by alien invaders. At first, it seems like fun giant robot escapism, but eventually, they find out the truth; the "invaders" are merely people like them, only from a parallel world. The "giant robot battle" is a sort of mechanism of the universe, by which representatives of each world are pitted in battle, and the losing world is wiped out of existence. In a typical manga, the heroes might take a moral stand and figure out some deus ex machina way of making everyone survive, but in Bokurano there is no way out. With its extreme, amoral "kill or be killed" situation, Bokurano is sort of a cosmic version of the novel/film Battle Royale, where teenagers are put on an isolated island and forced to kill each other off until only one survives. The weapon may be giant robots, but the law of the universe is tooth and claw. Bokurano is unrelenting, but it deals with sci-fi moral abstracts; manga with real-world political parallels are rarer. Shonen manga with political sentiments used to be much more common than they are now, one classic being Keiji Nakazawa's Barefoot Gen (1973), a realistic antiwar story about the Hiroshima bombing that is notable for having no real "bad guy." Pluto (2003), Naoki Urasawa's science fiction manga of morally conflicted combat robots openly based on a 1960s Astro Boy storyline, is full of references to the Iraq War (in the guise of the "39th Middle East War"); as a literal 'adult retelling' of a classic children's manga, it's perhaps more often compared to Watchmen than any other manga. But even in shonen manga, some artists try to mix shonen manga's sunny idealism with realpolitik subject matter. One such manga is Hiromu Arakawa's Fullmetal Alchemist (2001), an action-adventure story set in a vaguely steampunk world. The heroes begin the series working as State Alchemists for their vaguely Germanic homeland of Amestris, a country embroiled in various wars, but as the series progresses it becomes clear that Amestris is a ruthless military dictatorship and their fanatical "enemies," the clearly Middle-Eastern-styledIshbalans, are the victims of a genocide campaign orchestrated by the Amestris government. Although the teenage heroes, Edward and Alphonse, are unaware of the genocide when the series begins and rebel against their masters once they learn the truth, the twentysomething secondary characters, Armstrong and Mustang and Hawkeye, all took place in the massacre and have joined in the subsequent coverup. But they aren't bad guys deep down-having "obeyed orders" and committed atrocities in his youth, Colonel Mustang resolves to work within the system, climb in rank and gain power, so that one day he can control the nation and prevent such things from ever happening again. "I will protect your lives," Mustang tells his trusted subordinates. "And you will protect only whom you can…even if it's only a few, protect those below you. And those below you would also protect those below them. No matter what happens, live, continue to survive greedily. Live, and let's change this country together." Is the absolute coldness of manga like Bokurano more honest, or is Fullmetal Alchemist the more daring manga for taking on such loaded subject matter? Japanese comics are more likely to cast their conflicts in immediate emotional terms rather than grand ideals, but ultimately, the division between children's and adult manga is not so different than the division between children's and adult's comics in America — one assumes that the world can be divided into heroes and villains, and the other, to varying degrees, shatters those assumptions and looks unpleasant realities in the face. Jason Thompson is the author of the graphic novel King of RPGs and Manga: The Complete Guide. He also draws his own comics.